Once you register, all you have to do is search for the test name in the search box and add it to your cart. It’s that simple! Get your blood drawn and submitted for testing by going to any of the many INeedlabs locations offering this service in 46 states on the US (no appointment necessary and most locations are open on Saturday). Fasting is considered to be a period of 12 consecutive hours when no food or drink (except for water) is consumed. A good “rule of thumb” is to calculate when the blood will be drawn and then measure 12 hours before that time as the last time to consume food or drink. Example: If the blood will be drawn at 8 am on Tuesday, then the last time to eat or drink anything other than water is 8 pm Monday (the night before). Note: Normally, routine medication is allowed to be taken with water if it is due during the fasting period. The physician should be consulted to ensure the medication will not interfere with the test results. Sugar or Glucose Glucose test is used to determine diabetic management. Total Cholesterol – although the total measurement provides general information of the amount of lipid in circulation, doctors are usually more interested in the ratios among the various types of cholesterol (LDL and HDL) rather than in the total amount of it. Low Density Lipoprotein Cholesterol (LDL) commonly known as “bad cholesterol” – The common name is due to the fact that this fraction of Cholesterol is the one known to deposit in the arteries and causes atherosclerosis (hardening of the arteries). Therefore, it is best to keep the LDL at the lower limit of the normal range. High Density Lipoprotein Cholesterol (HDL) commonly known as the “good cholesterol” – This is the fraction of Cholesterol that is known to be rich in substances that actually help transport Cholesterol from various organs to the liver to be metabolized and cleared from the body. In other words, this HDL Cholesterol actually helps decrease the risks associated with LDL Cholesterol. Therefore, it is best to keep the HDL in the higher limit of the normal range. Triglycerides – are also a fat molecule that should not be in high concentration in the blood stream. This fat molecule can also be a risk for cardiovascular disease if not kept within normal range. The major health risks of high levels of fat in circulation are Coronary Artery Disease and Stroke. 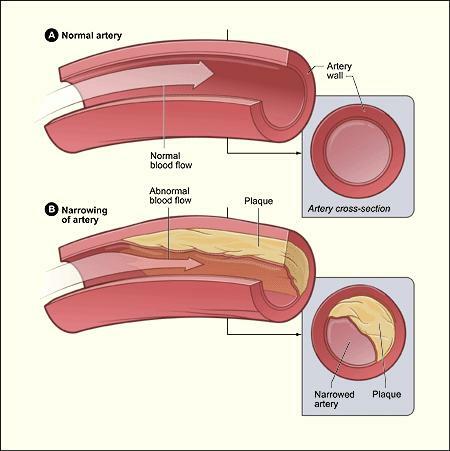 Prolonged high levels of fat produce the build up of “plaque” inside the arteries. With time and consistent high levels of fat in the blood stream, the plaque buildup can cause artery obstruction or blockage that can ultimately result in heart attack or stroke. Given the risks, it is common practice to measure lipid levels during routine checkups in order to be able to apply preventive measures if/when elevations are detected. It is worth noting that a lipid panel is not valuable unless it is performed from blood drawn while fasting.